Everyone is posting about the black hole and I haven’t seen this come up once. Come on, people. Get with it. Sorry, but spam comments on here have been obsessing me a bit lately. As such, I’m going to take today to give you a weekend spam update. Recently, I cleaned them out on a Friday evening and had 20 waiting for me by Monday morning. Of those 20, 11 were gambling (two were from the same place, rambling about Jesus, marriages, teaches, coffee mugs, and/or aikido…ending in the link for online gambling), 5 were generic quips without a link I could see that were still completely inapplicable to the respective post, 2 were for sketchy online pharmacies, one was for some kind of undirected advertisement for buying blog promotion, and one was something with enough code and multiple different language text that I didn’t look any further. Anyway, that was my spam for the weekend. How was yours? Frieda : What does the name ‘Aglet’ mean anyway? Braydon : Well a long time ago ‘Aglet’ meant ‘He who puts those tiny little plastic things on shoelaces’ you see a long time a go a mans’ name was his profession. Frieda : Oh so a man named Fred Carpenter would build houses and John Baker would make bread. Ned : So what did John Hancock do? It’s nothing about him, just his last name. Still, I think it every time. Sorry about that, man. Now THIS is a good animated gif of pancakes. They just don’t make animated gifs of pancakes like this anymore. 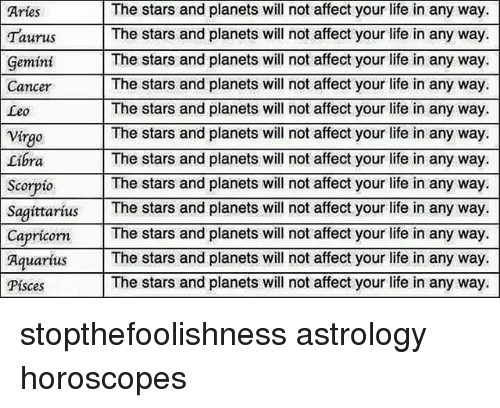 I’m not into astrology, but I think this meme might take things a BIT too far. After all, I’m pretty sure that the sun and earth are going to have at least a little effect on my life. Is It Weird That I’m Nostalgic For This? I’m fine with that if so. It is what it is. Is That The Spam Filter Working Or Not? I have separate spam filters on the blog here and on my email. When I get a new comment on the blog here that hasn’t been flagged as spam but should have been, it often gets caught in my email spam filter. That’s because it includes the text from the comment and the email filter correctly picked it up as spam. However, I don’t want the email spam filter to pick it up if it comes from the wordpress moderation email addresses because I need to tell wordpress it’s spam so they can adjust their spam filter. It’s both spam and it isn’t, or the email from wordpress isn’t spam but it contains the text of a message that is spam. Do I count that as my email spam filter working or not?